Radiogram sent to Squantum Naval Air Station at Squantum Point, Quincy Massachusetts. The telegram is usually credited to Rear Admiral Patrick N. L. Bellinger (October 8, 1885 – May 30, 1962) Commanding Officer of Patrol Wing Two. However, the message may have been sent in his name by Lieutenant Commander Logan "Beauty" C. Ramsey Sr. In 1945, Ramsey reported to the Joint Congressional Committee on the investigation of the Pearl Harbor: I saw, together with the staff duty officer, a single plane making a dive on Ford Island. The single plane appeared at the time to both the staff duty officer and myself in the light of a young aviator "flathatting" (flying low in a reckless manner) and we both tried to get his number to make a report of the violation of flight rules. He completed his dive, pulled up and away. We were commenting together on the fact that it was going to be difficult to find out who the pilot was, when the delayed action bomb which he had dropped, and which we had not seen drop, detonated, and I told the staff duty officer, "Never mind; it's a Jap." 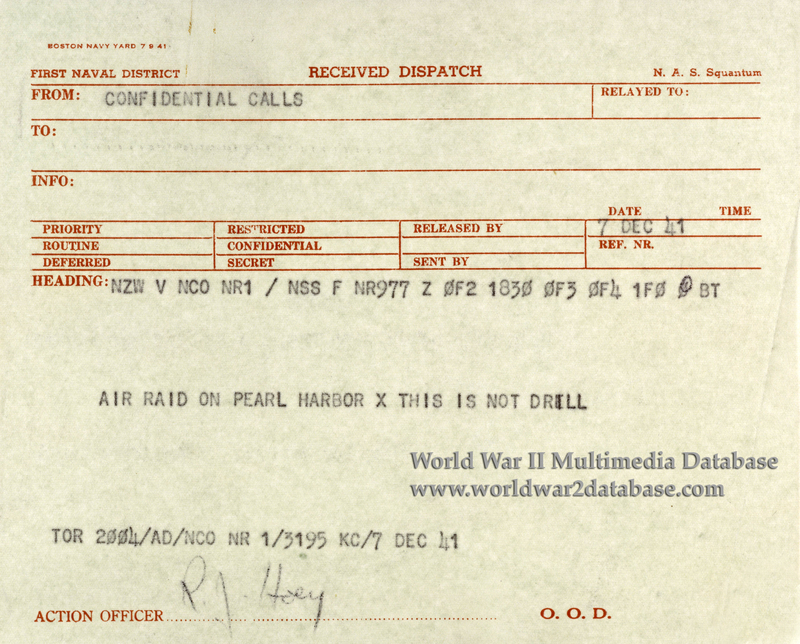 I dashed across the hall into the radio room, ordered a broadcast in plain English on all frequencies, "Air Raid, Pearl Harbor. This is no drill." The detonation of the bomb dropped by that first plane was my first positive knowledge of an enemy attack." Additional reports came in from the Navy Yard and Kaneohe; some reports were discounted until the Japanese planes overhead and the smoke from the burning ships were visible for miles. Some variations of the telegram use "NOT" instead of "NO" indicating they may have been received from another source, or their was a morse code error. Lieutenant Commander Logan C. Ramsey Sr.